Once again the FATF albatross is hanging around Pakistan’s neck. In June last year, FATF had placed Pakistan on the ‘grey list’ of countries whose domestic laws are considered weak to tackle the challenges of money laundering and terrorism financing. Aware of the fact that nothing significant has been done in this regard since June last year, Foreign Minister Shah Mahmood Qureshi decided to flash the easiest blame game card. During a press conference in Lahore on Monday he said “Pak could be blacklisted by FATF due to ‘lobbying by India’. This clearly reflects that Pakistan suspects the credibility of FATF. 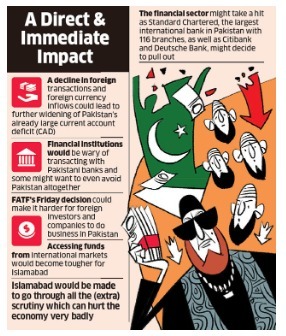 Firstly, let’s get the record straight, the factors which got Pakistan on board FATF grey list have more to do with their internal mismanagement or vested interests. Squarely blaming India for this “achievement” further exposes the Pakistani psyche. Long story cut short, how relevant is this statement from Pakistan’s Foreign office? Secondly isn’t it in bad taste to suspect and discredit FATF’s judgment – implying that it can be influenced? Most definitely a dossier, nailing the culpability of Pakistan in the terror attack in Pulwama will be given to the FATF, exposing the neighboring country’s links with terrorism (JeM) and seeking its blacklisting. However, Mahmood Qureshi has belled the cat way to soon and that too very inappropriately, for which the country may have to pay a very heavy price. What should Qureshi be actually worried of? -Pakistan’s banking channel could be adversely affected as it is inevitably linked with the international financial system. –The impact on Pakistan’s economy could be relatively wide, touching imports, exports, remittances, and access to international lending. -Foreign financial institutions may carry out enhanced checking of transactions with Pakistan to avoid risk of violations pertaining to money laundering and financing of terrorism. -Another affected is the sentiment of foreign investors. Pakistan placed on the black list will be covered in international news media and the fact will not go unnoticed by potential investors. -Stock prices at Pakistan Stock Exchange appear to have already felt this impact. Perhaps the biggest threat from being placed on the grey-black list is Pakistan could be pushed further down to the black list. Merely banning Jamaat-ud-Dawah (JuD’s) charity wing Falah-i-Insaniat (FIF) is not enough to get Pakistan off the grey list. In fact sources reveal that possibility of it’s moving from “grey” to “black” are very high. During its three-day visit to Islamabad in the last week of March, a delegation of the Asia-Pacific Group (APG) on money laundering, a regional affiliate of the FATF expressed serious reservations over insufficient physical actions on the ground against banned groups to block flow of funds and activities. The APG delegation noted that Pakistan had revised its terror financing risk assessment but did not demonstrate a proper understanding of the terror financing risks posed by Islamic State group, al Qaida, Jamaat ud Dawah (JuD), Falah-i-Insaniat (FIF), Lashkar-e-Taiba (LeT), Jaish-e-Muhammed (JeM), Haqqani Network and people affiliated with the Taliban. The APG also expressed concern over the government’s dual stance on action against the ones collecting donations from mosques. People of Pakistan are once again going to pay for the sins committed by the politicians and their mentors. It’s an open secret that these sins were perpetrated by the jihadi forces which are being backed by ISI and ISPR. Pakistan is loosing out to those who are managing top echelons of government and Pakistan Army. Pakistan has given out their land to the Chinese for their OBOR, they are accepting their currency, their language. Chinese are overzealously marrying Pakistani women. Pakistan is sending their Army to Saudi Arabia to help in their internal war, helping Islamic countries around the world with advanced science and technology yet, all show their backs when FATF knocks the door. In all of this, the only loser is a common Pakistani.